In 2015 the concentration of carbon dioxide was 400 ppm, for the first time ever. The atmospheric concentration of carbon dioxide equivalent (CO2e) was 543 ppm. Figure 1. Atmospheric Concentrations of GHGs in 2015 and Radiative Forcing from 1979-2015. Source: World Meteorological Organization. In this post I will catch up with the Greenhouse Gas Bulletin published by the World Meteorological Society in October, 2016. 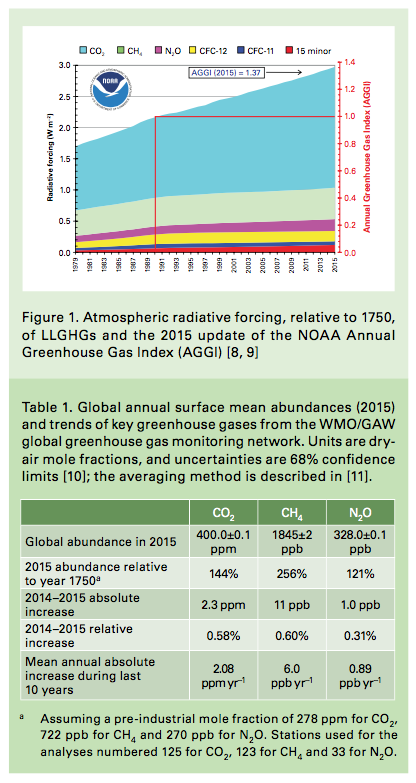 It concerns atmospheric GHGs during 2015. For the first time ever, the global concentration of carbon dioxide averaged 400 ppm, while the concentration of methane rose to 1,845 ppb, and the concentration of nitrous oxide rose to 328.0 ppb. These represent growth from 2014 of 0.58%, 0.60%, and 0.31%, respectively. The concentration of carbon dioxide is now 144% of what it was in 1750, while methane is 256% and nitrous oxide is 121%. The data are shown in Figure 1. The report does not calculate the carbon dioxide equivalent of the three combined, but simply multiplying methane and nitrous oxide by their global warming potentials yields a combined carbon dioxide equivalent of 543 (using the 100-year global warming potentials published in the IPCC 4th AR). Radiative forcing (the warming effect) of these GHGs was approximately 3.0 watts per meter in 2015 above 1750, compared to approximately 1.7 in1979. Figure 2. Source: Earth Systems Research Laboratory, 2017c. 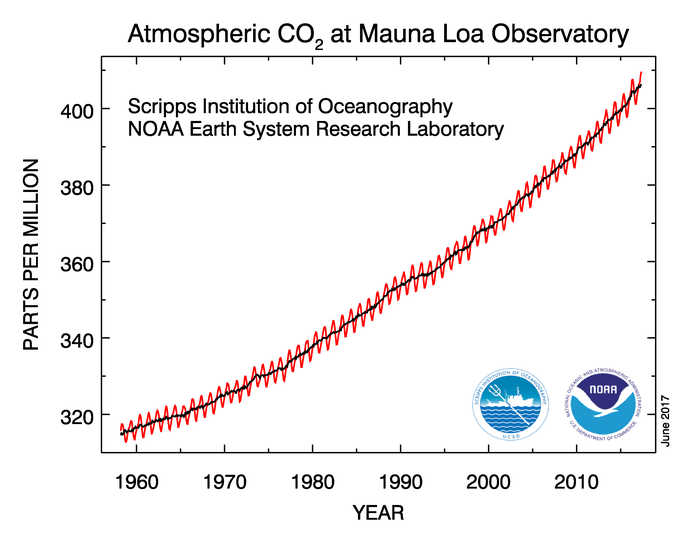 Figure 2 shows the recent data on carbon dioxide concentration as measured at the Mauna Loa Observatory. The red line represents the actual measured value, and the black line represents the trend. This location is often taken as the best place to measure atmospheric carbon dioxide concentrations because it is in the middle of the Pacific Ocean, far away from large local sources of carbon dioxide, high in the atmosphere, and buffeted by almost constant trade winds. The chart shows that the concentration of carbon dioxide surges each winter, then ebbs each summer. This seasonal effect is due to the summer greening of the Northern Hemisphere, where the bulk of the world’s land mass is. Once it has greened, the vegetation absorbs carbon dioxide and converts it to oxygen as part of the process of photosynthesis, pulling it out of the atmosphere. After the vegetation goes dormant during the winter, it does not absorb carbon dioxide, and the concentration increases. The reading for May, 2017 was 409.65 ppm. Earth Systems Research Laboratory, 2017 a. Figure 3 shows the same data going back to the late 1950s. Though the concentration of carbon dioxide surges and ebbs each year, you can see that the trend is irrevocably upward. The peak each winter is higher than the previous winter’s high, and the low point each summer is higher than the previous summer’s low. At no time has this trend ever reversed, in fact it has never even slowed. If anything, the trend is curving upward, meaning it is increasing faster. In the next post I will discuss what these findings mean. Earth System Research Laboratory. 2017a. Full Mauna Loa CO2 Record. Downloaded 2017-06-15 from https://www.esrl.noaa.gov/gmd/ccgg/trends. Earth System Research Laboratory. 2017b. 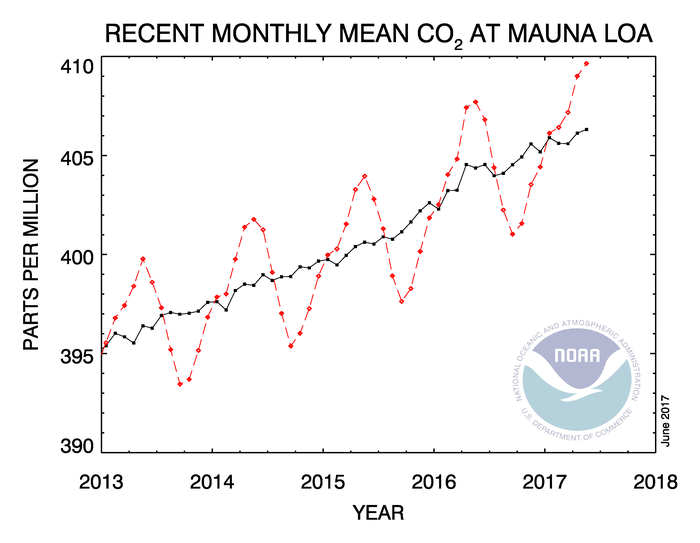 Mauna Loa CO2 Annual Mean Data. Downloaded 2017-06-15 from https://www.esrl.noaa.gov/gmd/ccgg/trends. Earth System Research Laboratory. 2017c. Recent Monthly Average Mauna Loa CO2. Downloaded 2017-06-15 from https://www.esrl.noaa.gov/gmd/ccgg/trends. By mogreenstats in Climate Change, Greenhouse Gas Emissions on 2017/07/06 .